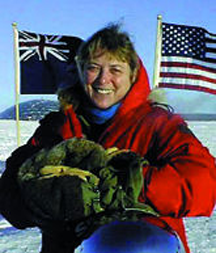 Dr. Jerri Nielsen at Amundsen-Scott South Pole Station in 1999. Dr. Nielsen was serving as the base doctor during the Antarctic winter of 1999, when she discovered a lump in her breast. With evacuation impossible, she consulted Dr. Kathy Miller, an oncologist at the Indiana University Cancer Center. By email and video link, Dr. Miller guided Dr. Nielsen in performing several biopsies on herself. Later, after an airdrop of medical supplies, Miller guided Nielsen in the administration of hormonal therapy and chemotherapy. Certainly this technical achievement is impressive, but Miller must also have pioneered methods of calming and comforting her patient virtually. We tend to consider virtual relationships in the context of routine business events, but undertaking dispersed projects also entails a commitment to managing extraordinary events virtually. Hoping that extraordinary events won't occur is not enough. For instance, for missions to Mars, when extraordinary events occur, success might depend on the virtual relationship skills of those involved. See "Doctor at South Pole Received Medical Help via Video," by Denise Grady, in The New York Times for October 22, 1999. Dr. Neilsen (with Maryanne Vollers) wrote about her experience in Ice Bound: A Doctor's Incredile Battle for Survival at the South Pole. Order from Amazon.com. Photo courtesy Lawrence Berkeley National Laboratory. In modern workplaces, face-to-face communications are a declining portion of all communications. We use a variety of communications media — telephone, text messaging, email, videoconference, and even interdepartmental mail and snail mail. Collegial relationships have taken on an increasingly virtual character. We regularly work with people we rarely meet face-to-face, and in some cases, we've never met and probably never will. In contrast to the face-to-face relationship, we must be more deliberate about maintaining a warm, cooperative, and mutually beneficial virtual relationship. In virtual relationships, we lack access to the little cues that indicate friendship and respect, on which we rely to maintain the health of our relationships. At first, being deliberate can feel false, and this leads many to avoid expressing friendship and respect, even indirectly. If you have this experience, try to recall how you felt when you received such expressions of friendship from another. Probably it felt good. The good news: with practice, the feeling of phoniness fades. Here are some tips for maintaining healthy virtual relationships. If you always wait until you absolutely need something from your colleague, then you might inadvertently "train" him or her to associate a message from you with your needing something. If you think it might be appreciated, send a short hello-how-ya-doin' once in a while. If either of you has a shortage of interruptible time, making appointments can be a welcome courtesy. Sending a note such as, "Do you have five minutes this afternoon?" can be more respectful than an unexpected phone call. At times, you might find yourself at a meeting also attended by one or more of your virtual colleagues. Take advantage of these situations to say hello, have lunch, or spend some time not focused on work. Unless the meeting has an immediate and specific purpose related to the work you're doing together, use the time in other ways. Make introductions when you can. Connect your virtual colleagues to other people at your site, or to other virtual colleagues of yours. Check first, though — they might already have met (virtually or otherwise), or one or the other might not wish to meet. If you hear of something that your virtual colleague might like to know (other than gossip), pass it along. And send thank-yous when they're deserved. Both will be appreciated. Would you like to see your comments posted here? rbrenXnzRUhaVTBFFqkByner@ChacgwPTShcdcCCBbFwFoCanyon.comSend me your comments by email, or by Web form. See also Personal, Team, and Organizational Effectiveness, Emotions at Work and Virtual and Global Teams for more related articles. I offer email and telephone coaching at both corporate and individual rates. Contact Rick for details at rbrenYoZsZXVeBobdpmrrner@ChacaooDvTGbJkkMqVcOoCanyon.com or (650) 787-6475, or toll-free in the continental US at (866) 378-5470.